Leaf Relief by Ply Gem is more effective than any other type of gutter protection at keeping natural debris, such as leaves, twigs, and pine needles, from blocking your gutters. It's Gutter Protection that really works! Leaf Relief by Ply Gem can drain 29.7" of rainfall an hour on a 20 ft. section of gutter. That's more than the highest rainfall amount ever recorded! (Holt Missouri 1947 at 12" in one hour.) Leaf Relief is not only the most effective gutter protection system on the market it is also the most invisible. 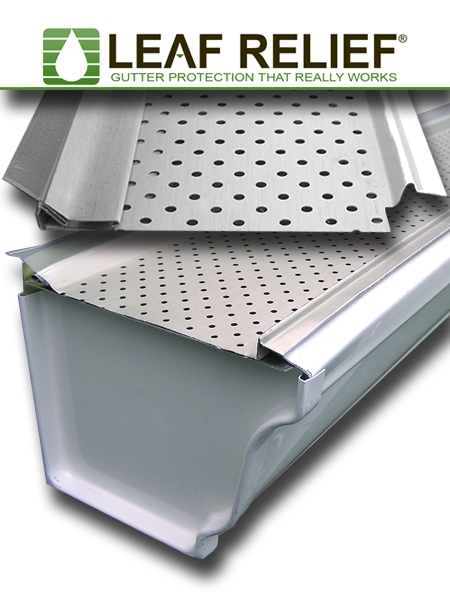 Leaf Relief lays flat and fits snug on top of your gutter.